In November last year, DVDFab announced it was working on a utility to easily downgrade the firmware of so-called Ultra HD Blu-ray friendly drives. Nowadays, most of those drives come with newer firmware that prevents backing up Ultra HD Blu-ray discs. With the new tool, that was released today, it’s possible to easily downgrade to a firmware version that allows copying UHD BD discs. 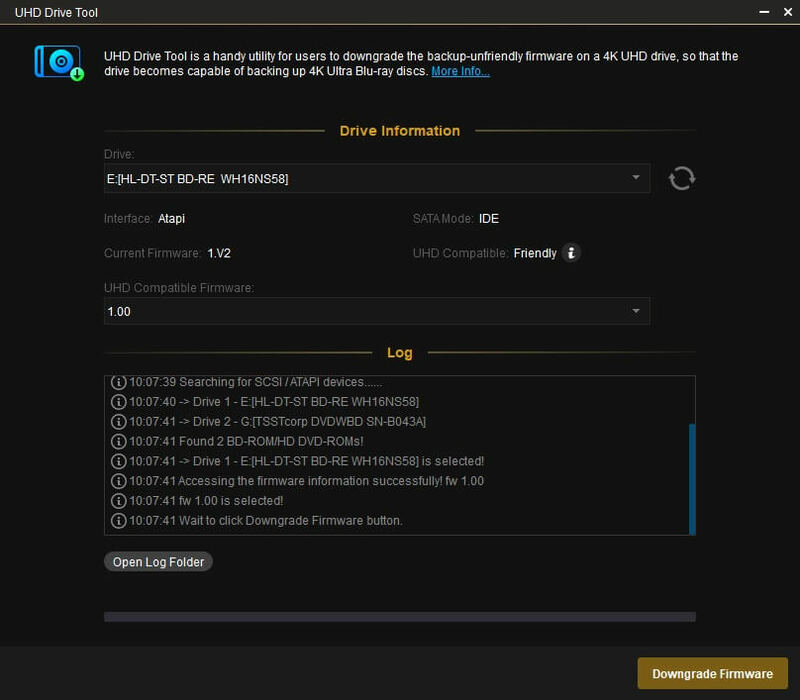 The tool is called, DVDFab UHD Drive Tool. Initially it works on a list of drives that contains popular models from Asus and LG, such as the LG BH16NS40 and ASUS BW-16D1HT. DVDFab states it will continue adding support for other drives as well. The process is simple and once the SATA port of the drive is in IDE mode, it’s no more than simply clicking the ‘Downgrade Firmware’ button, if the drive isn’t already UHD Friendly. If the drive doesn’t contain Ultra HD Blu-ray friendly firmware, a backup of the current firmware is made, the UHD friendly firmware is downloaded and then flashed to the drive. It’s important that the computer is not powered off during the process. DVDFab UHD Drive Tool is available in the Windows version of DVDFab v11.0.1.x or later, running on Windows 7, Windows 8, Windows 8.1 and Windows 10. Currently the tool does not work on USB connected drives and on motherboards that only allow SATA Mode to be in AHCI. DVDFab UHD Drive Tool can be purchased with 50% off for all unexpired DVDFab All In One users. New users can get a 30% discount valid till the 10th of February 2019.